PUZZLED WITH YOUR IT WORKSPACE SOLUTIONS? Gartner calls Awingu a ‚unified workspace‘. In our own words: we bring any application and file to the browser of any device. And that includes your personal device. We offer a rock solid, flexible and simple alternative to classic VDI and Application Virtualization technologies such as Citrix XenApp or XenDesktop. Easy to use. Easy to upgrade. At Awingu, we like to keep it simple. There is no need to make life more complex. Why go through the pain of upgrading the most recent Citrix version? 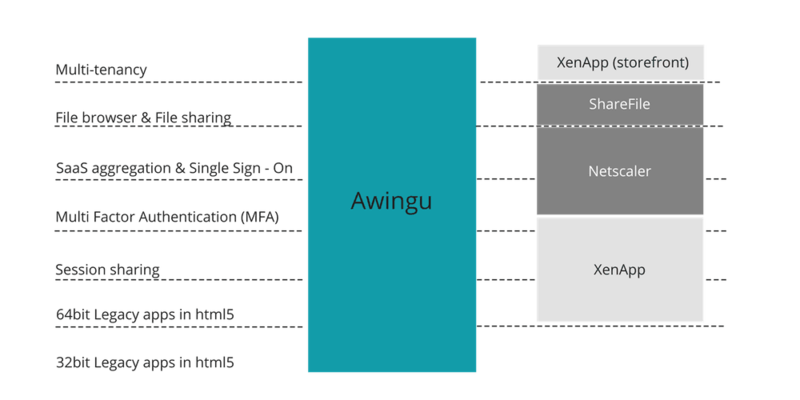 We dare to make a TCO comparison between the Citrix and the Awingu licence costs. HOW DOES AWINGU COMPARE TO CITRIX? Awingu is packed with all the functionalities you need to run an online workspace. It’s focused on simplicity and ease-of-use. Compared to Citrix, it offers the core functionalities of XenApp, ShareFile and Netscaler. One solution. One license. Simple. We understand that complexity grows with time. But today, times are different. At Awingu, we like to keep it simple. End-users take any device and securely connect via their browser. There is no need to make life more complex. It’s just one product. And pricing couldn’t be more straight forward or transparent. Do your end-users ’need‘ a local agent on their device? Do your colleagues tell frustrating stories of how they can’t run their business tools (apps and files) on their beloved Apple MacBook, tablet, Chromebook, etc.? Do you ’need‘ to buy and maintain 3 (or more) different products (e.g. Xen App/Desktop, Netscaler and FileShare) to provide workplace services? Does your admin need days (or rather weeks) to run version upgrades? UPGRADING SHOULDN’T BE PAINFUL, BUT AS EASY AS POSSIBLE. We know: upgrading Citrix-based environments can be a real pain. We’ve seen too many cases where upgrades are so time consuming and expensive (e.g. because you need to build a fully new solution) that businesses are just not upgrading. They prefer to stay on older, often unsupported, versions. At Awingu, we believe version upgrades should be as simple as a click of a button. Our development teams take that literally! Have a look at this illustrative video: we show upgrades from Awingu 4.0.2 to Awingu 4.0.6. Feel free to count the number of clicks. UP TO 81% BETTER PRICING ON LICENSES ALONE. NOW THAT IS A GOOD DEAL. We took the challenge and compared TCO based on Citrix‘ „Quick Reference Pricing Sheet“ (Aug 2016). Maybe you are one of the happy customers with a rock bottom ‘tailor made‘ discount? Or maybe you just pay too much. To cut to the chase: we made one master simulation (below) that shows Awingu is up to 81% cheaper on licensing alone. Support: no need to install or maintain any agents or receivers. Pick a device. Start working. Minimal support, huh? Hardware and software: Awingu doesn’t require any installations on the application servers in the back-end. Conversely, adding things like a Citrix receiver can increase the load by an average of 20%. Training: Built for simplicity and intuitiveness, we are proud to have a very low need for training. Show it once, and users are up-and-running. Don’t believe us? Try Awingu for yourself!